Fort Mason has had an illustrious history. The fort was established as a military base by the Spanish in 1797. It was subsequently claimed by the U.S. Army when California entered the union in 1850. In 1863 it was reactivated to defend against potential Confederate attack. 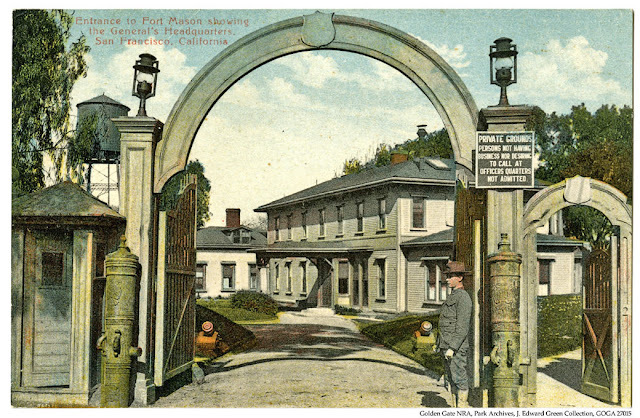 Following the Civil War, the post served as the military headquarters of the U.S. Army on the West Coast. 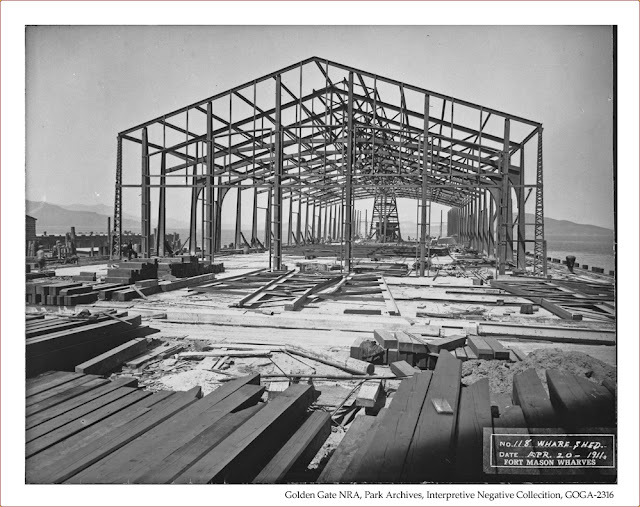 In response to the 18 April 1906 San Francisco earthquake and fire, and recognizing the critical role of Fort Mason as a naval operations center, Congress appropriated funds to construct three piers that are still in use today. 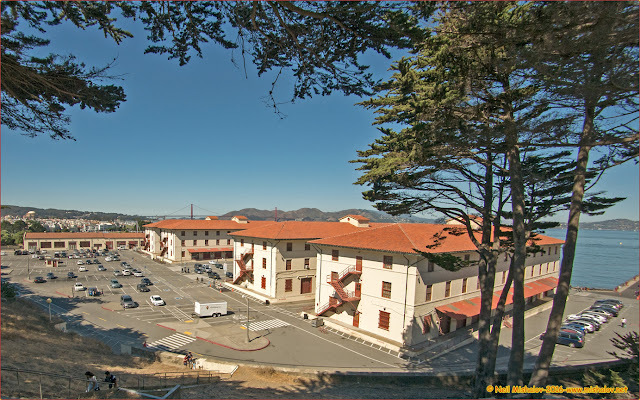 Built on land reclaimed from a tidal cove, Fort Mason served as the San Francisco Port of Embarkation, the organizational center for the military, from 1909 to 1962. As the San Francisco Port of Embarkation, one of Fort Mason's first missions was the delivering of supplies and personnel to the western portion of the Panama Canal construction site. 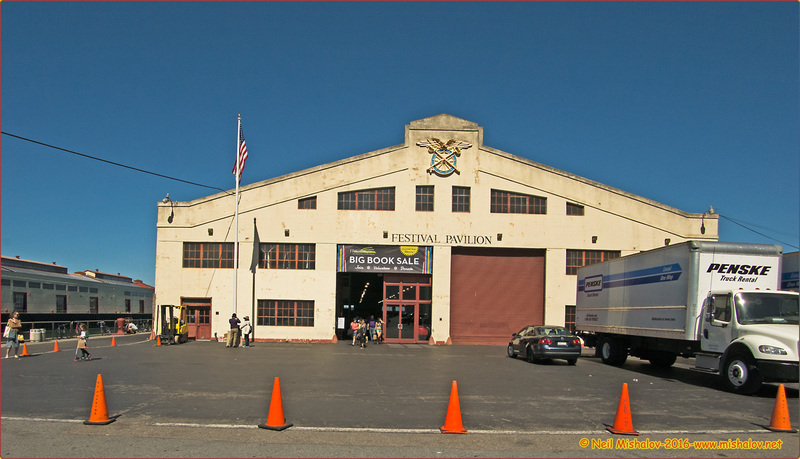 During World War II, Fort Mason commanded a vast network of personnel and shipping facilities throughout the Bay Area. 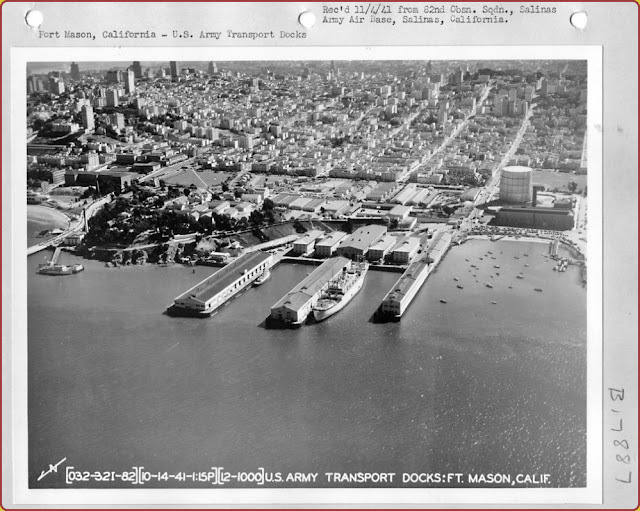 More than 1,500,000 troops and over 23,500,000 tons of cargo shipped out to the Pacific theater of war from Fort Mason's three piers. 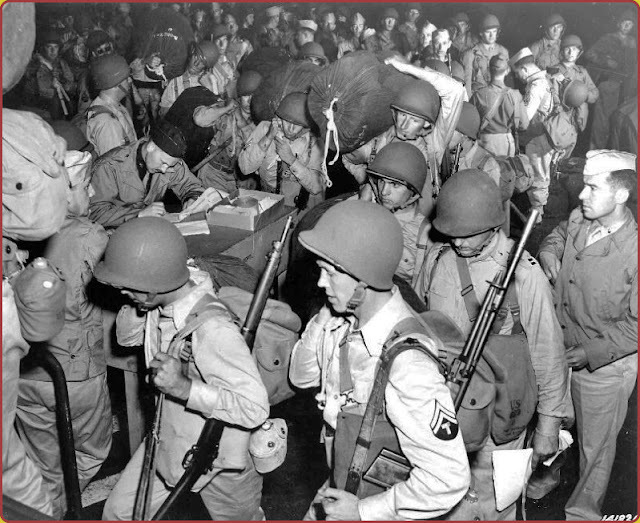 The surrender of Japan on 2 September 1945 saw the flow of soldiers and cargo leaving for the Pacific reversed. Between September 1945 and October 1946, Fort Mason welcomed nearly 800,000 homebound troops. In 1962 the army declared the site to be military surplus. Fort Mason was then turned over to the National Park Service. In 1972 Congress established the first urban national park, the Golden Gate National Recreation Area. Fort Mason is a part of the Golden Gate National Recreation Area. 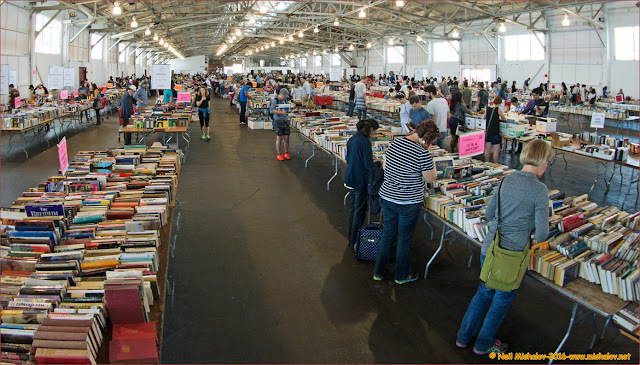 A view of the 52nd Annual Friends of the San Francisco Public Library Big Book Sale. The sale took place in Fort Mason on Pier 3. Click the image to see the full-size photograph. The distance traveled was approximately 5.5 miles (8.8 kilometers). The cumulative elevation gain was about 360 feet (110 meters). Mile markers are displayed on the GPS generated track. Click the image to see the full-size map. 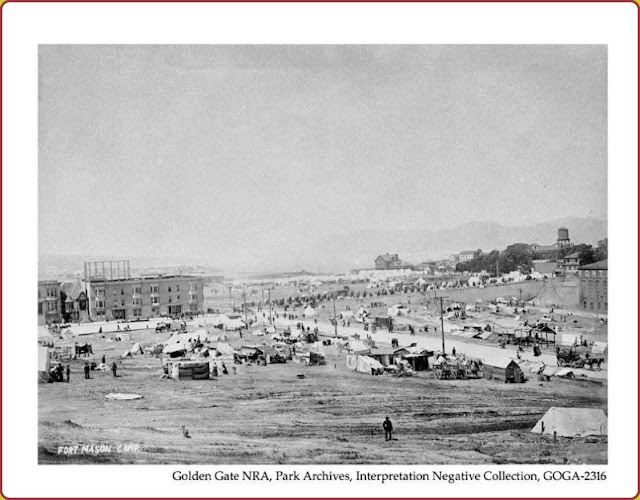 This photograph of tents on the Fort Mason parade ground was taken soon after the 1906 earthquake. 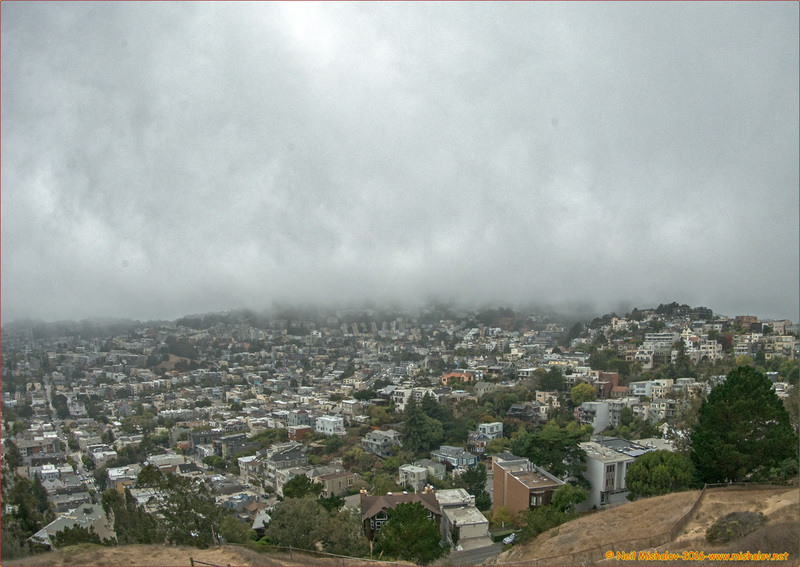 Many San Franciscans became homeless due to the fires and collapsed buildings. Temporary housing was put up all over San Francisco to house the homeless. The temporary housing was removed within a year of the earthquake. The construction of Pier 2 took place during 1911. 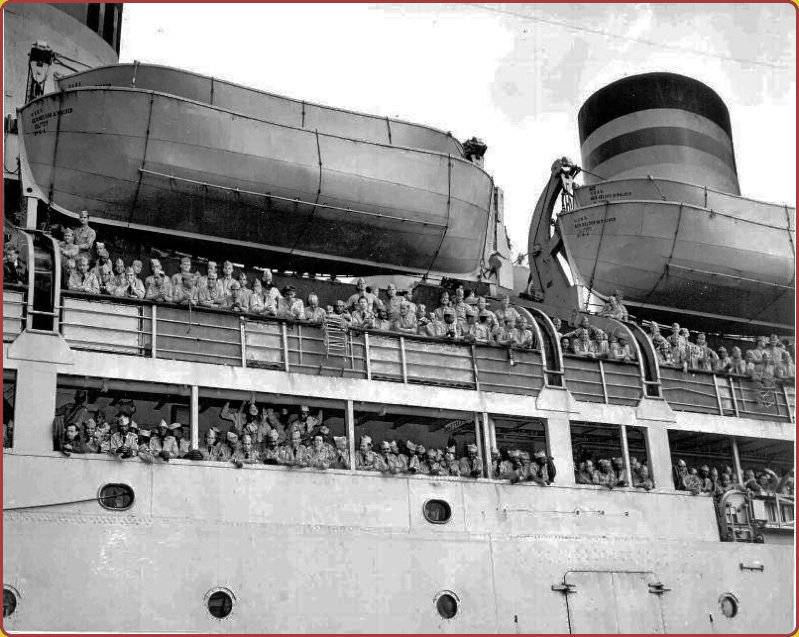 U.S. Army soldiers boarding a troopship at Fort Mason for transportation to the Pacific theater of war during World War II. 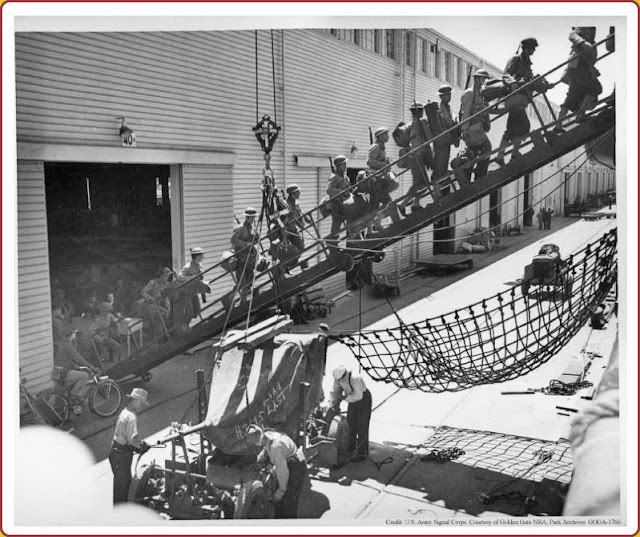 Army soldiers at Fort Mason are heading up a gangplank to a troopship. 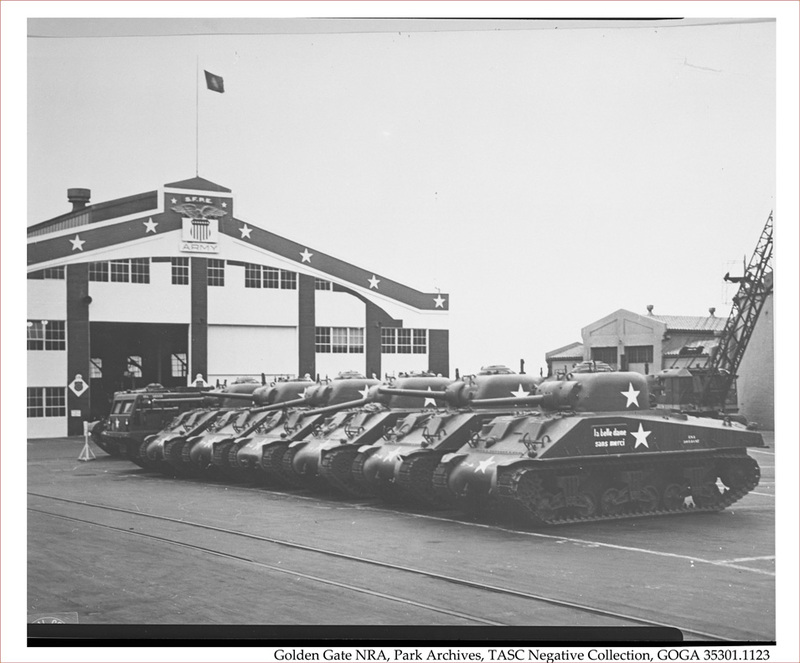 M4A4 Sherman Tanks ready to be shipped to the Pacific theater of war. The M4A4 Sherman tank was built by the Detroit Tank Arsenal between July 1942 and November 1943. 7,499 M4A4 tanks were constructed. This picture was taken in front of Fort Mason's Pier 3; the current site of the San Francisco Public Library's Annual Book Sale. A U.S. Army Mail Orderly stationed at Fort Mason is distributing mail aboard a troopship about to leave Fort Mason for the Pacific theater of war. A view of Fort Mason and its three piers as seen on 4 November 1941. Pier 3, the current site of the San Francisco Public Library's Annual Book Sale is on the left. 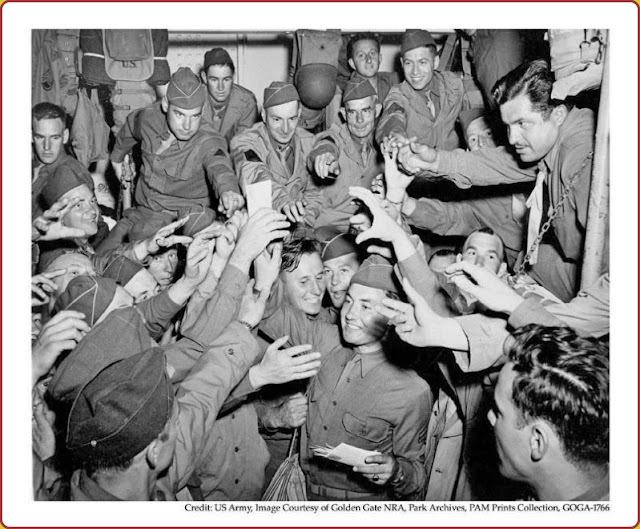 This picture shows troops returning to Fort Mason from the Pacific battlefront; the war is over. More than 800,000 soldiers arrived at Fort Mason on their trip back home. This picture was taken in 1945. 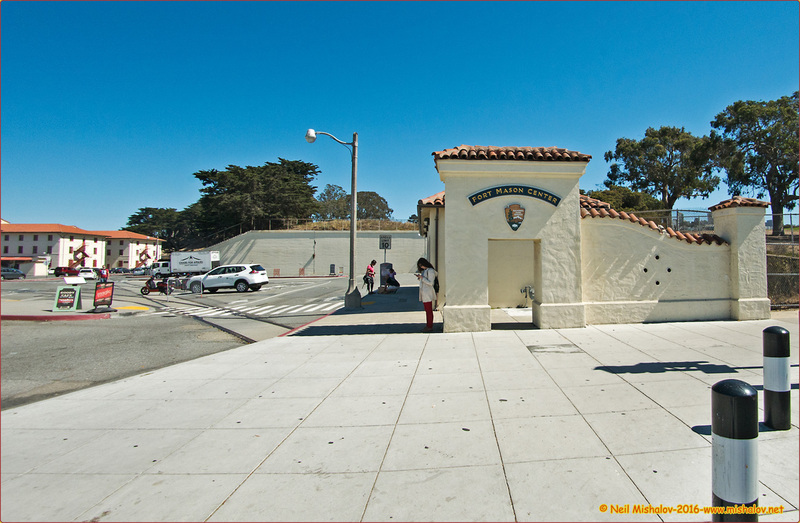 A current photograph is showing the entryway to the pier area of Fort Mason. This is a view from Beach Street, San Francisco. Click the image to see the full-size photograph. Between 1877 and 1943, McDowell Hall was Fort Mason's commanding officer's residence. 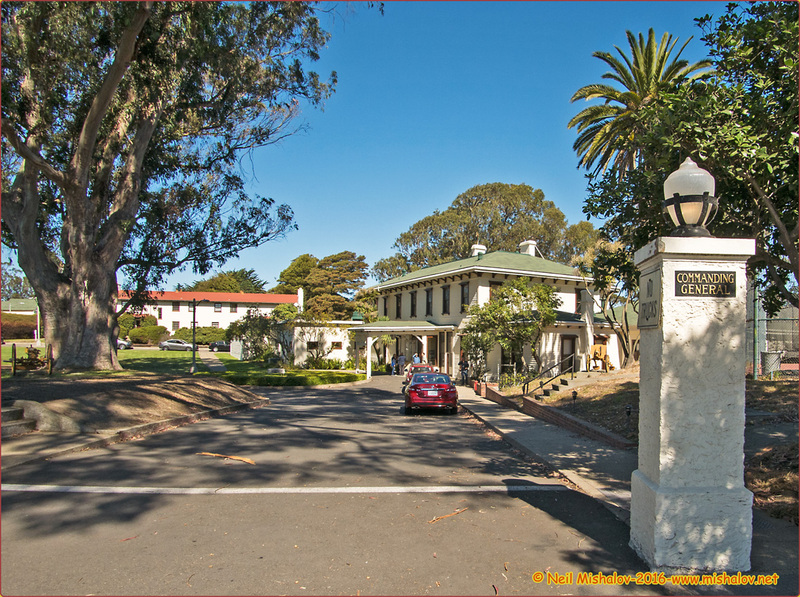 The army constructed the Italianate building in 1877 to provide a home for the post's commanding officer as well as a social center for important military gatherings. There was a covered entrance way to protect visiting dignitaries from the rain as they disembarked from their means of transportation. THEN This old postcard shows McDowell Hall, the headquarters of the Commanding General of Fort Mason. This photo is circa the 1920s. NOW This photo of McDowell Hall was taken on 24 September 2016. Click the image to see the full-size photo. This intriguing photograph was taken soon after San Francisco was jolted by a 7.9 magnitude earthquake at 5:12 a.m. on 18 April 1906. Brigadier General Frederick Funston, the Commanding General of Fort Mason who is 41 years old, is shown adjacent to the covered entryway at the front of McDowell Hall. He is conferring with two government advisors. 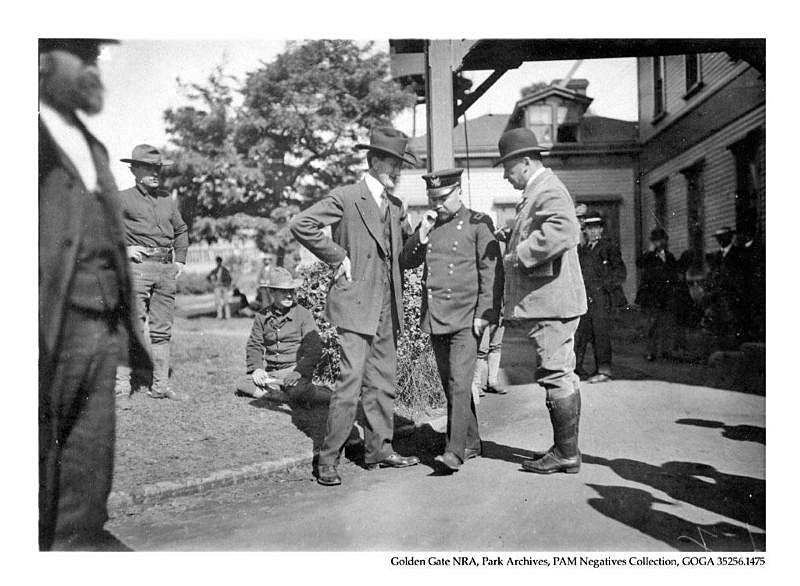 General Funston believed that U.S. Army soldiers should assist the San Francisco police and fire departments to regain civil order, and also fight the raging fires that have just started. He immediately set up a military command center in McDowell Hall to assist the city in dealing with the extensive damage and ensuing chaos and anarchy. General Funston had an urgent meeting with E.E. Schmitz, the Mayor of San Francisco, later that day. Shorty thereafter, the mayor issued a proclamation stating that federal troops and San Francisco police officers were authorized to kill looters in the government's efforts to restore law and order. Approximately 500 looters were killed by the police and military during the period of the military emergency. 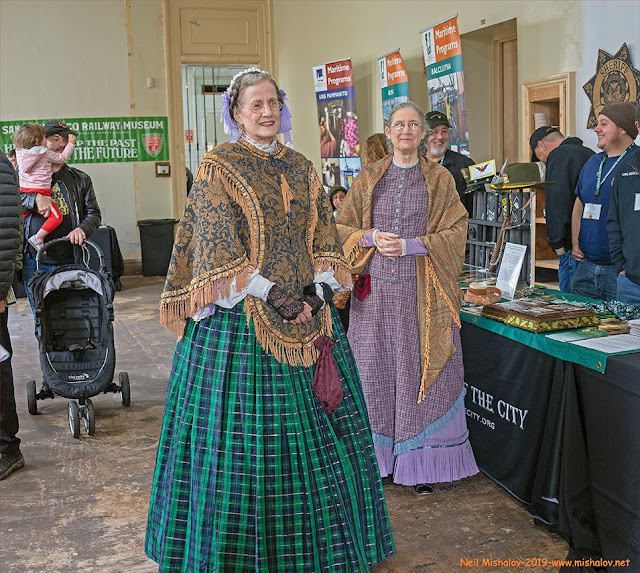 City officials established a temporary City Hall at Fort Mason and together, military and civilian authorities maintained order in the devastated city. General Funston died in Texas in 1917 at the age of 51. 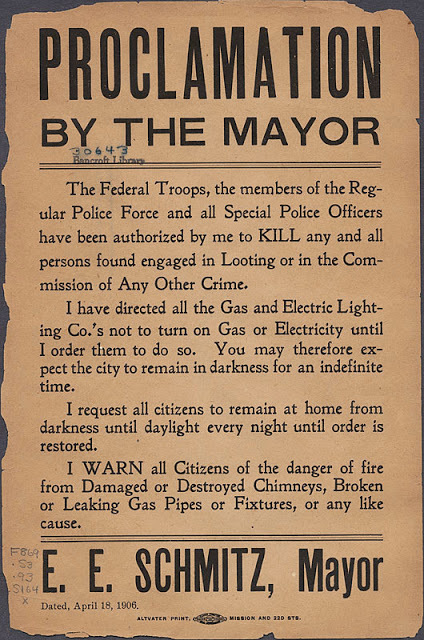 The San Francisco 1906 Earthquake Proclamation by E.E. Schmitz, Mayor of San Francisco. 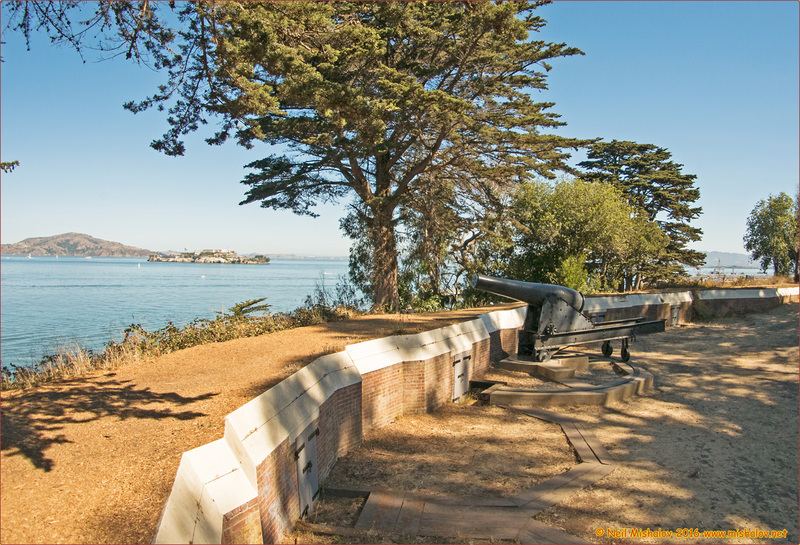 As an emergency response to the Civil War, the United States Army built a twelve-gun, two battery fortification at Fort Mason in 1864. 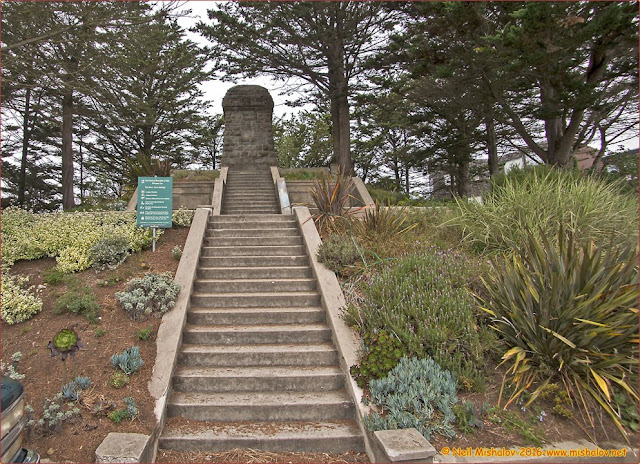 These two batteries, known as Battery East and Battery West, served as a back-up fortification to the three fortifications already defending the Golden Gate entryway to San Francisco Bay. Those fortifications were located at Fort Point, Angel Island, and Alcatraz Island. The two batteries at Fort Mason eventually became outdated and they were demolished in 1911. The location of Battery West was then covered with earth and lay hidden for 70 years. In 1982 the National Park Service excavated and restored Battery West. This is a view of the restored battery. Click the image to see the full-size photo. 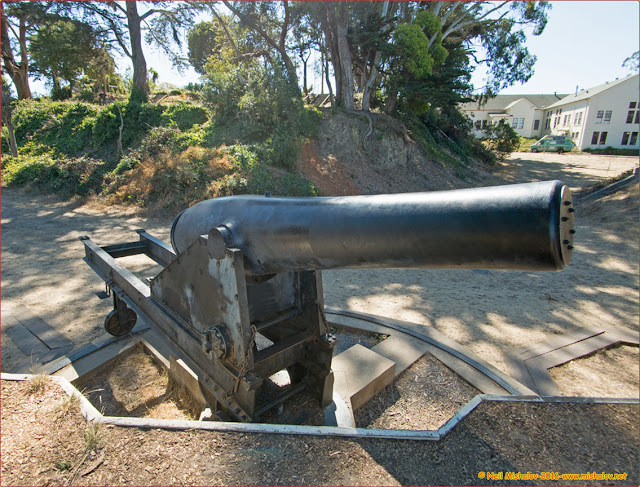 This 10 inch Rodman Gun is sited at the restored Battery West. Click the image to see the full-size photo. 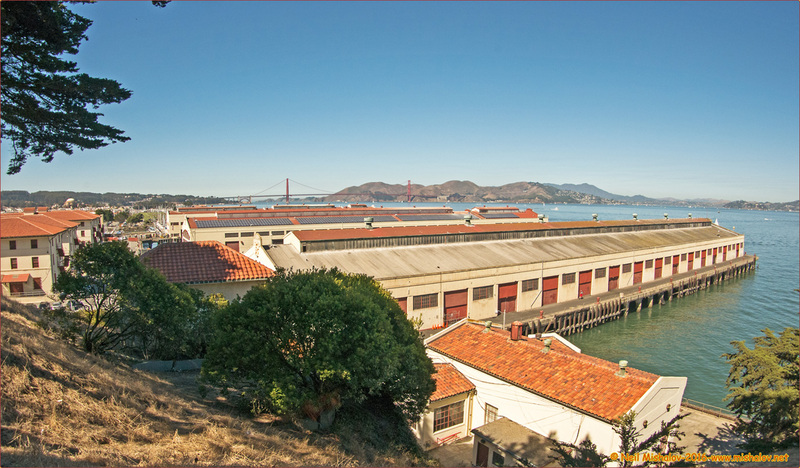 The three Fort Mason piers are visible in this view from Battery West; Pier 3 is on the right. The Golden Gate Bridge is in the distance. The view is looking West. Click the image to see the full-size photograph. 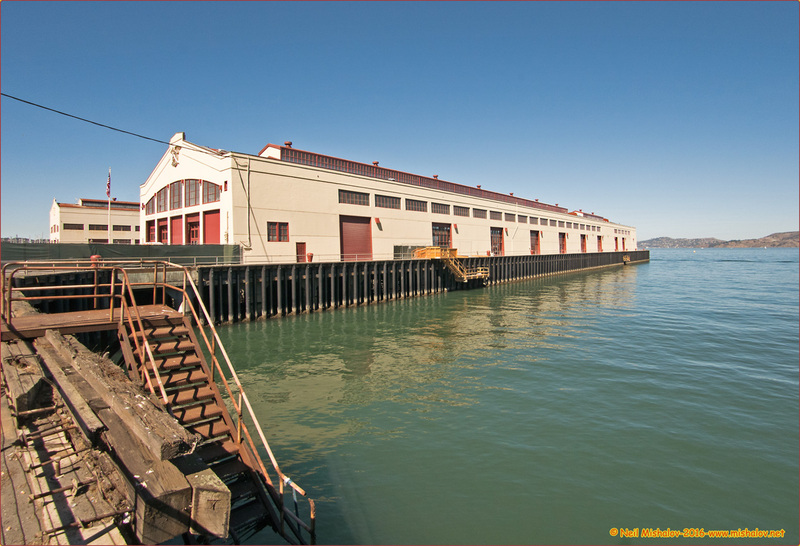 A photo of historic Pier 2. Click the image to see the full-size photograph. 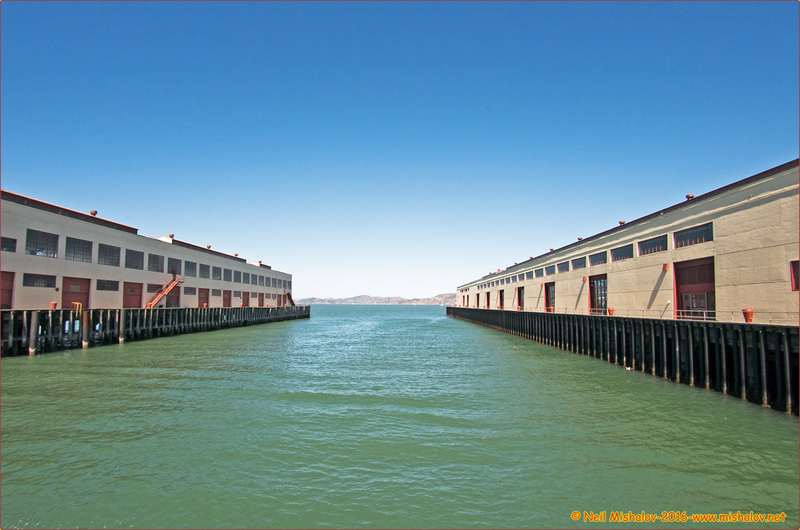 Pier 1 is on the left and Pier 2 is on the right. The view is looking North. Click the image to see the full-size photo. The pier area of Fort Mason. The buildings were used as Army offices and warehouses. Click the image to see the full-size photo. The San Francisco Public Library 52nd annual book sale took place at Pier 3. 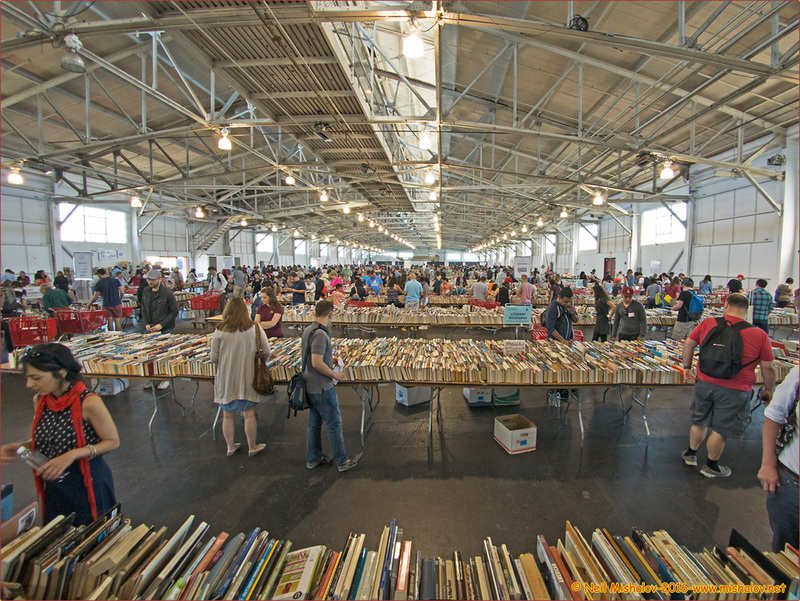 There were more than 500,000 new and used books available for sale, at very inexpensive prices. Click the image to see the full-size photograph. The entryway to Pier 3, the location of the San Francisco Public Library book sale. The view is looking North. Click the image to see the full-size photograph. 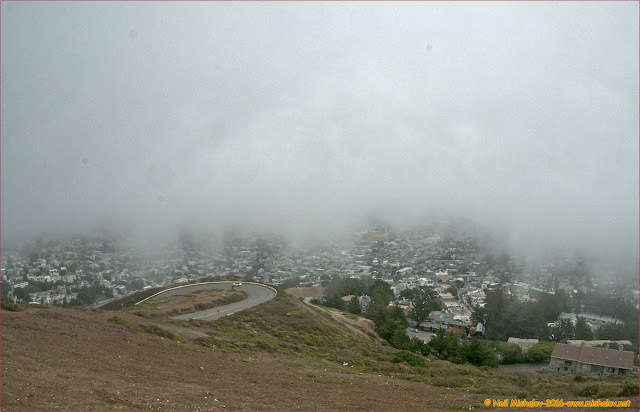 My first San Francisco Bay Area Photoblog contains galleries of photographs that I posted between 2002 and 2011. Click Here to view the 2002 to 2011 photo galleries. 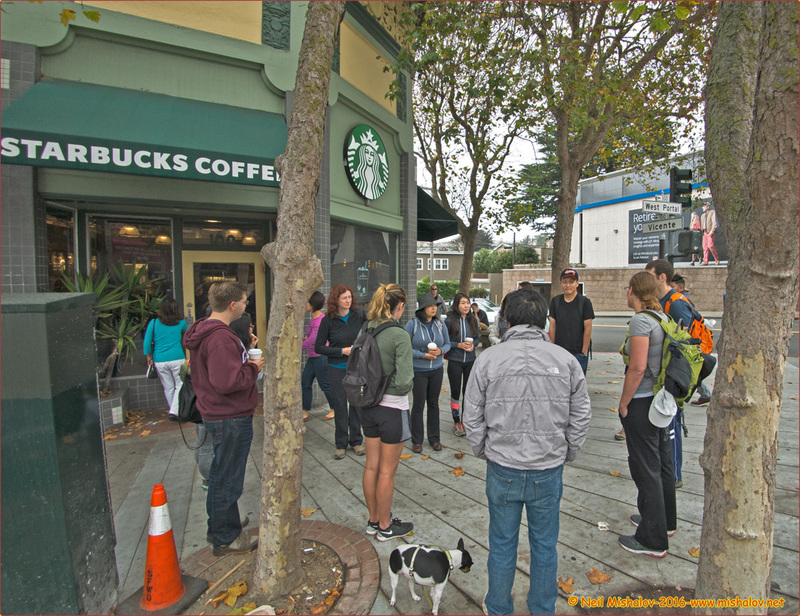 Sixteen people met at 9:00 a.m. at Starbucks Coffee on West Portal Avenue in San Francisco. 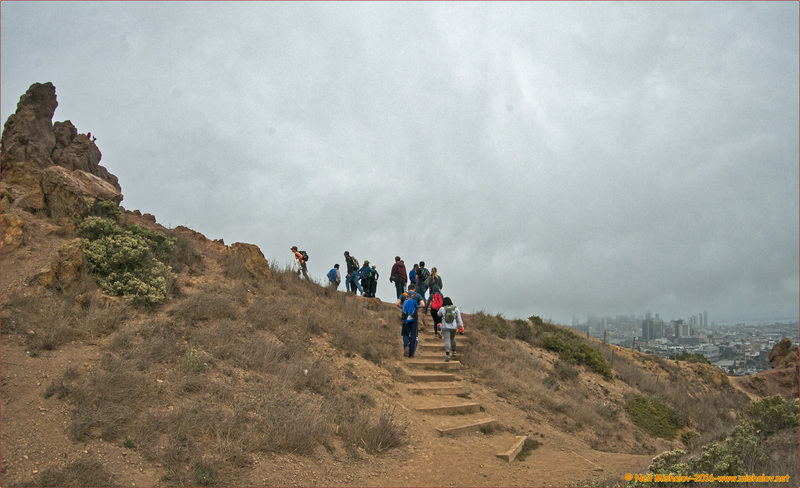 Lincoln was going to lead the group on a hike of San Francisco's mountain peaks. The agenda included Mount Davidson, Twin Peaks, Mount Sutro, Tank Hill, Mount Olympus, Corona Heights Park and Grand View Park. The fog was dense, and it was windy and cold; precisely the kind of weather that builds character! I used a wide-angle 9mm fisheye body cap lens to take the photographs. I left the walk in the Haight-Ashbury neighborhood, at which time I walked up to Carl Street where I boarded an N-Judah streetcar going to a BART station. A view from the summit of Corona Heights Park. Downtown San Francisco is ahead on the left. The fog is beginning to lift. Click the image to see the full-size photograph. The distance I traveled was approximately 10.4 miles (16.7 kilometers). 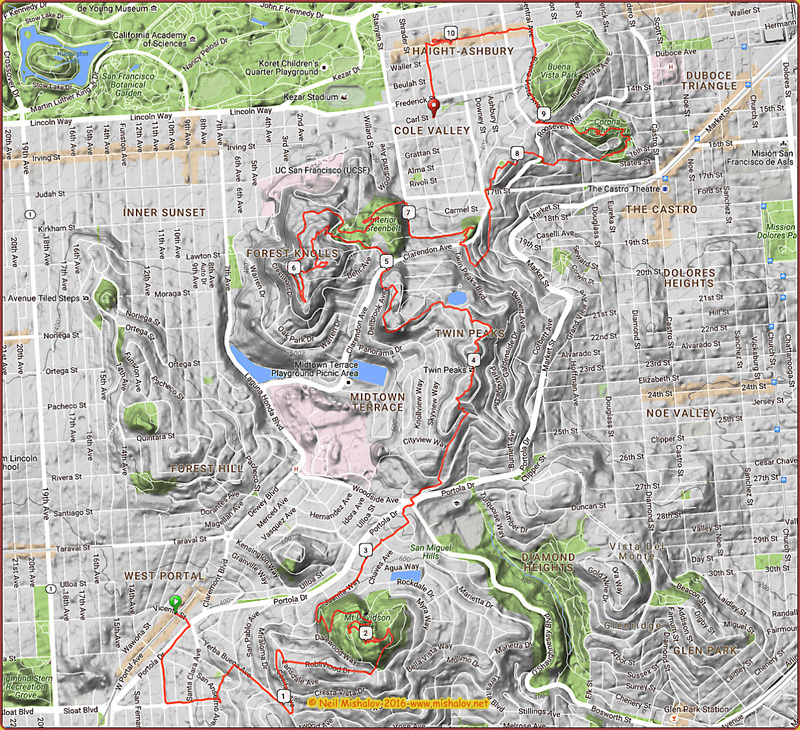 The cumulative elevation gain was about 2,071 feet (631 meters). Mile markers are displayed on the GPS generated track. Click the image to see the full-size map. The group meeting at Starbucks Coffee in the West Portal area. Click the image to see the full-size photo. 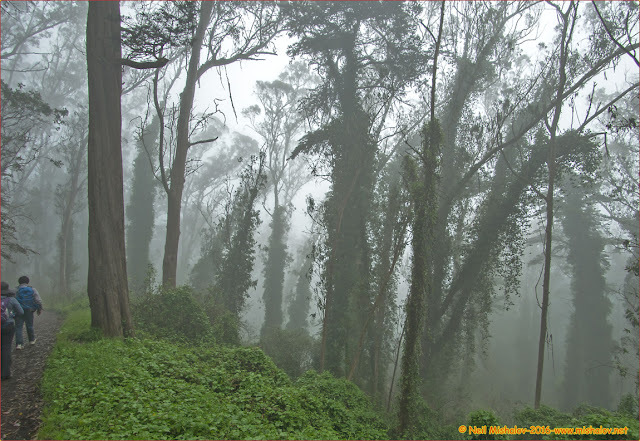 The fog was thick as we climbed Mount Davidson. Click the image to see the full-size photograph. The cross on the summit of Mount Davidson. 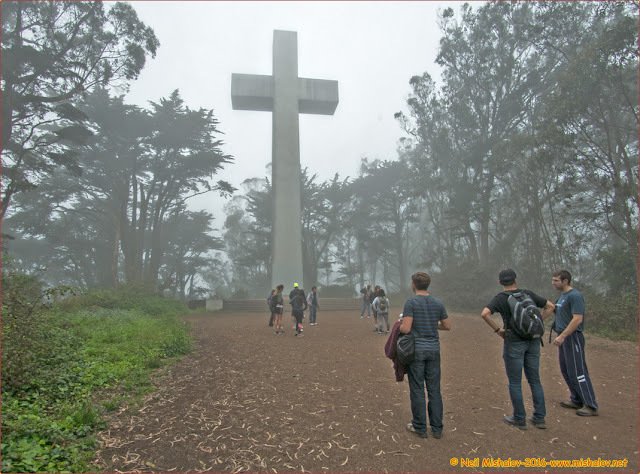 Mount Davidson with an elevation of 928 feet (283 meters), is the highest natural point in San Francisco. Click the image to see the full-size photo. 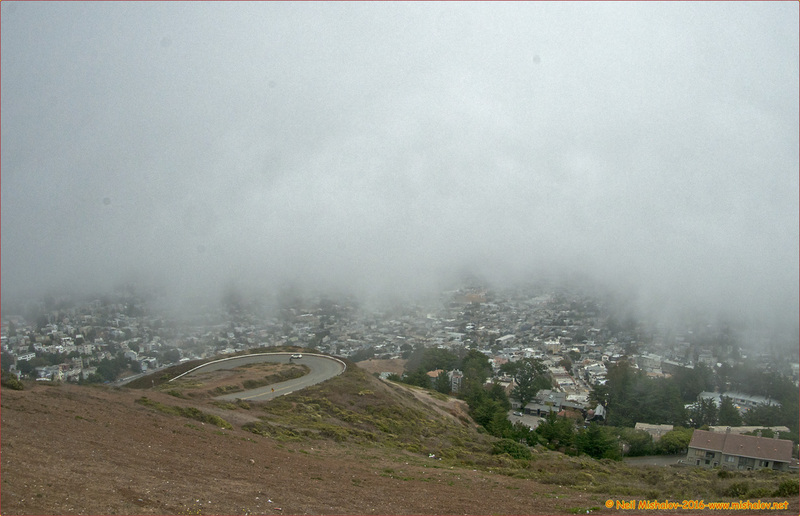 On Noe Peak, 910 feet (277meters), the southern portion of Twin Peaks. 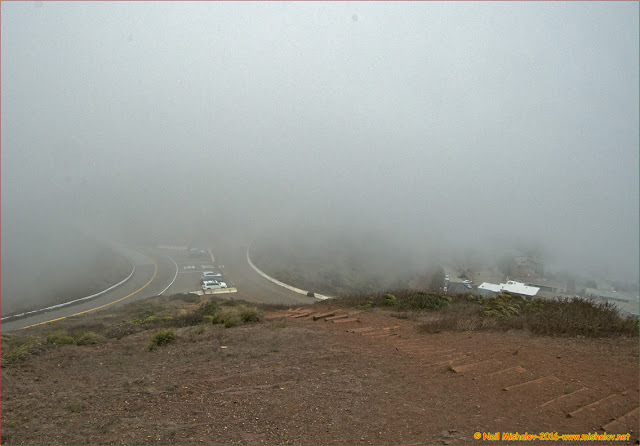 It was windy, cold and foggy. Click the image to see the full-size photograph. 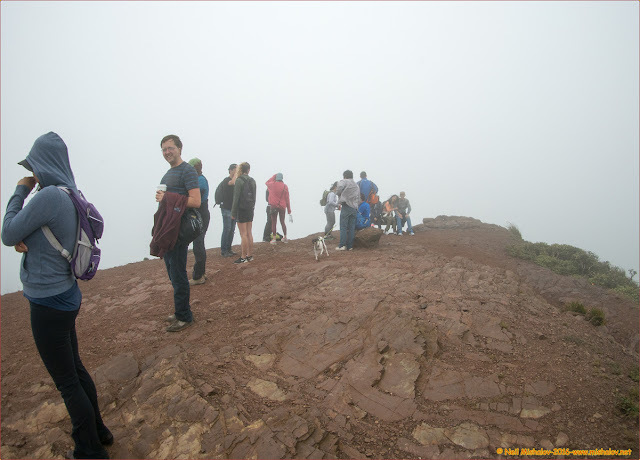 Descending Noe Peak and preparing to ascend Eureka Peak, 904 feet (276 meters) the northern peak of Twin Peaks. Click the image to see the full-size photograph. A view from Eureka Peak looking East. Click the image to see the full-size photograph. A view from Tank Hill 650 feet (198 meters), looking North. Click the image to see the full-size photograph. A view of Mount Olympus 553 feet (169 meters). Click the image to see the full-size photograph. 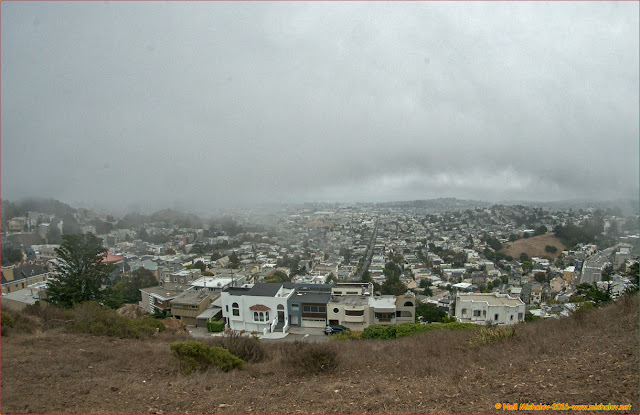 A view from Corona Heights Park, looking South. Click the image to see the full-size photograph. The summit (520 feet, 158 meters), of Corona Heights Park. 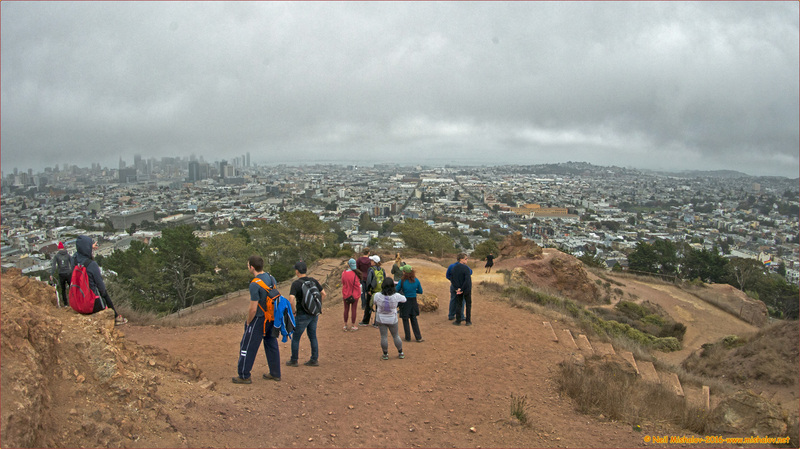 Downtown San Francisco is visible in the background. Click the image to see the full-size photograph. This graph shows the elevation changes encountered during the hike. Click the image to see the full-size chart.